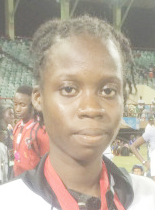 Guyana’s Deshana Ashanti Skeete produced a stirring 400m run to give this country its first gold medal of the second South American Youth Games yesterday in Santiago, Chile, while Jermaine King and Kenisha Phillips added to the lustre with silver medal performances. Competing in the 400m final, Skeete clocked 57.28s to shock her South American competitors including the favoured Brazilian Jessica Vitoria Oliveira Moreira who had to settle for second place despite having a personal best time of 56.21s. However, her final effort of 57.54s was only good enough for her to be second best to the brilliant Guyanese Skeete. Third place went to Andreina Valencia of Ecuador who clocked 58.81s. Earlier, King clocked 10.963 to place second in the men’s 100m final while Phillips clocked 12.18 seconds in the female 100m final. The 100m men’s final was won by Paraguay’s Fabrizio Acquino in 10.92s while Colombia’s Gian Carlos Mosquera Mosquera took the bronze in 10.966s. Colombia’s Angie Saray Gonzalez Echeverria won the female 100m final in 12.114s while another Colombia Shary Julitza Vallecilla Quinonez was third in 12.27s.